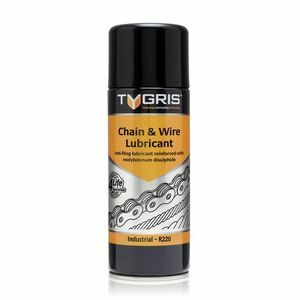 Tygris R220 is a heavy duty, molybdenum disulphide reinforced lubricant which penetrates deeply into drive chains and wire ropes to give long lasting lubrication, preventing corrosion, wear and chain elongation. It gives outstanding performance under extreme load and is resistant to fling off. This item is classed as a HAZARDOUS PRODUCT and as such has delivery/courier restrictions under the Limited Quantity regulations. Unfortunately, delivery cannot be made to addresses with the following GB postcode prefixes: BT, GY, IM, JE, KA27, PA41-PA78, PO30-PO41, TR21-25. We cannot deliver hazardous goods outside UK. *to mainland uk only, does not apply to 205 ltr drums.